I have been out of school for four years. So those first day jitters are something that are now a distant memory. While I don’t miss classes, professors, and grades I definitely miss the anticipation of showing off my “back-to-school” wardrobe. Many of your classmates have not seen you all summer, so the beginning of the school year is your time to shine. Also if your parents are anything like mine were, back to school is when you have the biggest shopping allowance. It doesn’t hurt to take advantage of that. 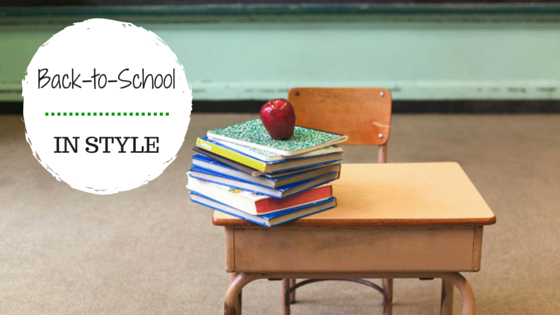 The beginning of the school year sets the tone for your personal style. It is when you make your statement to your classmates about who you are. Clothing has a way of doing the talking for you. For example, my senior of high school on the first day of school I wore a stylish dress, ballet flats, and a pendant necklace. Not earth shattering, but it was my way of showing I had broken away from the Hollister/Abercrombie pack. I didn’t care about fitting in anymore, I wanted to stand out. Which for me, was a big deal. Don’t get lazy— always look your best. It is easy to shift into wearing yoga pants and a sweatshirt (especially in college). I am all for comfort, but it also important to put your best foot forward. Not to get all adult-ish, but it is good practice for life. You never know when opportunities might come your way. Do you want to be in Uggs and leggings when that happens? Side note: I practiced what I preach. In high school I dressed up every day and in college I only allowed myself to wear sweats/leggings for my early morning classes. Don’t be a afraid to stand out. In high school especially, it feels important to stick to the status quo. Keep in mind that people who stand out tend to be the more successful ones in life. Be a leader. Set the trends. Wear what makes you happy. I remember trying so hard to fit in until one day I decided that I would rather stand on my own. Positives changes followed. Make the classroom your runway. Here are few looks perfect for heading back to school! You like your outfit to hand a little edge while putting a grunge spin on hottest trends. You are a flower child born in the wrong decade at heart. You lean toward flowy boho outfits. You are girly girl who is well put together. You have an eye for the little details that make an outfit pop! Gigi Hadid and Kendall Jenner are your style icons. Whether you live in a city or not, all of your outfits have an urban zest. Have a great school year fashionistas! Study hard and look fabulous!